Pittsford Town Hall is located at 11 South Main Street, Pittsford NY 14534; phone: 585-258-6200. Photo: Spring House, ca. 1832, 3001 Monroe Avenue, Pittsford, NY. 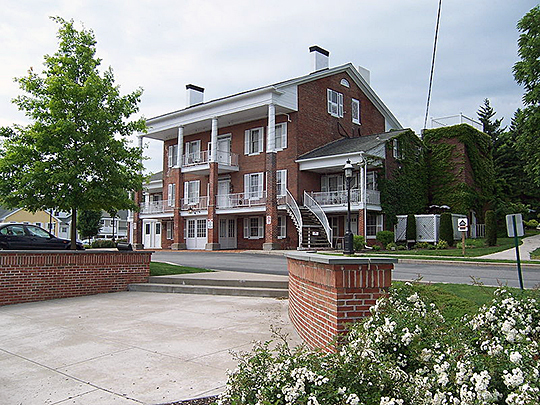 This historic Inn was built overlooking the Erie Canal before the canal was rerouted further south. Listed on the National Register of Historic Places in 1975. Photographed by User: Matthew D. Powers (own work), 2009, [cc-by-3.0 (creativecommons.org/licenses/by/3.0)], via Wikimedia Commons, accessed October, 2012. Pittsford was named by early settlers who came from Pittsford, Vermont. It comprises the first settlements in the eastern part of Monroe County. The Erie Canal passes through the town. Pittsford was incorporated in 1827. In August of 1789 Israel and Simon Stone along with Seth Dodge, purchased of Phelps and Gorham 13,296 acres, including nearly all of what is now Pittsford. They were from Salem in Washington County. In 1791 Israel and Simon Stone brought not only their families, but those of Jasiel Farr, Silas Nye, and his sons Nathan, Silas Jr., and Caleb, Thomas Cleland, Major Ezra Patterson, and Joshua Gininson. Simon Stone built the first saw mill. Noah Norton, who settled in 1794, built the first frame house. Jason Sawens and Dr. Daniel Rood came about 1793. Reverend Thomas Billinghurst was the first preacher. The first frame school house was built in 1804. Settlement proceeded rapidly from 1800-1805 with many new families coming in. Many of the early settlers had considerable property; as the primary and earliest settlement in the region, it attracted men of wealth, some of whom held slaves. A number of the earliest pioneers were Revolutionary soldiers: Ebenezer Graves, Captain Henry Gale, Captain Silas Nye, Deacon Samuel Stone, Thomas Cleland, Caleb Hopkins, Joel Dunn, and Claudis Victor Boughton, among others. In the earliest days, the main commercial business was the distilling of whiskey. Samuel Hindreth was a prominent early merchant and landlord as well as the proprietor of the stage. He came in 1814 and set up a store. Wait Martin was an early hatter. Elihu Doud had a brick yard. History of Monroe County, New York, Everts, Ensign, & Everts, Philadelphia, 1877.